Midlands Components manufactures critical components, metal fasteners, nuts and bolts for the Oil and Gas, Aerospace, MoD and Automotive sectors. It was established in 2013 by a group of partners who had previously worked together in different capacities, each with experience of the sector and with complementary engineering and business expertise. 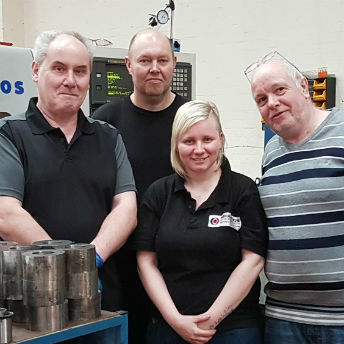 ART approved a loan to support cashflow during the months that didn’t look so strong, allowing Midlands Components to invest in more people and equipment, and also offered valuable advice. “It can be intimidating when potential funders start asking for proof that you will make a profit and be able to grow and sustain your business as well as pay them back, but Roz was brilliant,” says Sean. “She helped us through every stage to ensure that we asked ourselves the right questions and put together sound sets of figures. She encouraged us to ask for the amount we really needed, not less just to avoid a rejection. Roz stressed that is important to be realistic. She also recommended an asset finance company that helped us to purchase three new machines that increased capacity and removed constraints within the factory.